Several large employers in Wichita ask to avoid paying millions in taxes, which increases the cost of government for everyone else, including young companies struggling to break through. This week the Wichita City Council will hold public hearings concerning the issuance of Industrial Revenue Bonds to Spirit AeroSystems, Inc and other companies.1 In the IRB program, government is not lending money, and Wichita taxpayers are not at risk if the bonds are not repaid. In fact, in the case of Spirit, the applicant company plans to purchase the bonds itself, according to city documents. Instead, the purpose of the IRB process is to allow Spirit to escape paying property taxes and, often, sales taxes. The listing of USD 259, the Wichita public school district, is likely a mistake by the city, as the Spirit properties lie in the Derby school district. This is evident below. These figures reveal that the City of Wichita is forcing a decision on a neighboring jurisdiction that it would not accept for itself, unless it uses one of many exceptions or loopholes. This adverse decision is forced upon the Derby School District. It faces a benefit-cost ratio of 1.16 to 1, which is below the city’s standard of 1.30 to 1, unless an exception is cited. 2 The Derby School District is not involved in this action and has no ability to influence the issuance of these bonds, should it desire to. We have to wonder why the City of Wichita imposes upon the Derby school district an economic development incentive that costs the Derby schools $731,614 per year, with a substandard payoff? These values are offset by a Payment-In-Lieu-Of-Taxes (PILOT) estimated at $13,251 annually. Here we see the same mistake with the Wichita and Derby school districts. We also see the Derby school district giving up $506,502 in tax revenue, with no positive return. Spirit is not the only company asking for tax relief through IRBs this week. Three other companies are making similar requests. In none of these cases is economic necessity cited as a reason for escaping taxes. None are threatening to leave Wichita if the relief is not granted. There’s plenty of evidence that entrepreneurship, in particular young business firms, are the key to economic growth. But Wichita’s economic development policies, as evidenced by these actions, are definitely stacked against the entrepreneur. As Wichita props up its established industries, it makes it more difficult for young firms to thrive. Wichita relies on targeted investment in our future. Our elected officials and bureaucrats believe they have the ability to select which companies are worthy of public investment, and which are not. 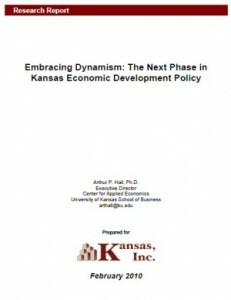 It’s a form of centralized planning by government that shapes the future direction of the Wichita economy. This year American City Business Journals presented the results of a study of small business vitality in cities. 3 Wichita ranked at number 104 out of 106 cities studied. Awarding incentives to large companies places small business at a disadvantage. Not only must small business pay for the cost of government that incentivized companies avoid, small companies must also compete with subsidized companies for inputs such as capital and labor. This finding is counterintuitive. People can easily see the large companies. They are likely to know someone that works there. But it is the unseen effects that must be considered too, and that is rarely done. Everybody I know is tired of these special deals big business gets from local government. Wichita is truly robbing the poor and giving to the wealthy.